Third grade students worked laboriously to create a mosaic for all to enjoy. 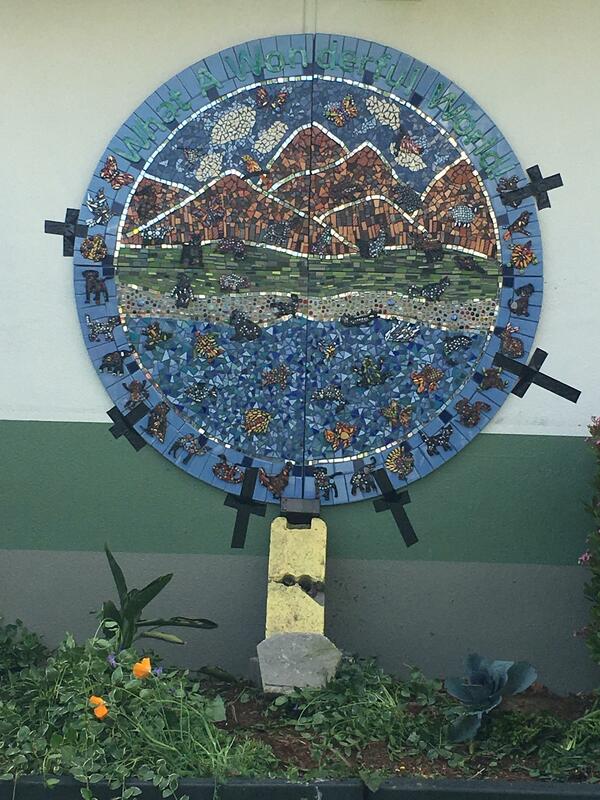 Thanks to a generous grant provided to Santee by ArtsEd Connect, Mosaic artist and educator, Nancy Meyer, lead our third grade students in creating a joint mosaic mural that integrates earth science and the arts. The mosaic Earth, titled "What a Wonderful World," is divided into three parts: mountains, land, and ocean. Students collaborated to make the mosaic earth and produce individual mosaic animals to adhere to the earth. This project was profound in that it provided our students with an opportunity to learn a new art form, and also a chance to practice domain-specific language related to the ecosystems SEAL unit by engaging in a low affective activity. The beautiful mosaic now hangs at the entrance of our campus. Depending on the time of day and season, the mirrored mosaic pieces reflect at different points on the grass in front of it. Third grade teacher Jennifer Kerrick is proud of the work her students accomplished. She stated, "The ArtsEd Connect grant provided an unbelievable opportunity for third graders to engage in a craft that they most likely wouldn't be exposed to. The finished piece is such a masterpiece and will be enjoyed by the Santee community for years to come!"